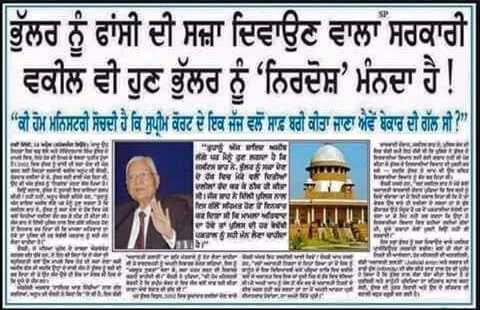 It was more of a media judgement because the judges were affected by the wave of media resentment against the Sikhs. IT IS A BLOT ON INDIAN JUSTICE. 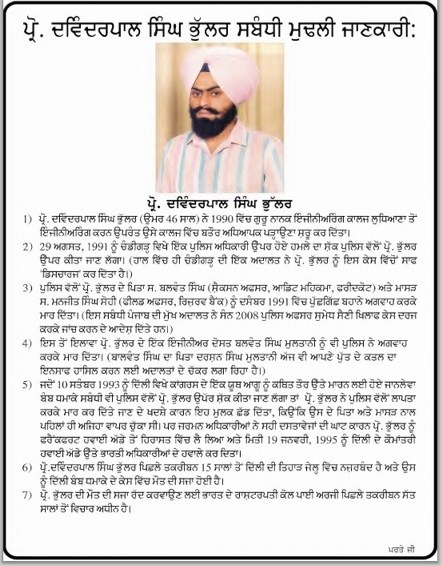 This document provides information about Professor Devender Pal Singh Bhullar, who is currently (as on 16/Nov./2009) confined in Tihar Jail, Delhi (Ind.) and is awaiting execution of death sentence pronounced by the Indian courts and confirmed by Supreme Court of India in Devender Pal Singh Versus State National Capital of Delhi and others. case in a "split decision". Once to be a lecturer at Guru Nanak Engineering College (GNE) Ludhiana, Bhullar had to leave his house when Sumedh Saini, then SSP of Punjab Police abducted and killed his father, uncle and engineer friend in 1991. Bhullar left India and was passing through Germany when he was stopped by German authorities at Frankfurt airport and was found travelling without proper papers. He was deported to India and here he was tired for his alleged involvement in a Bomb Blast leaving 9 persons dead. Police said that the target of this 1993 blast was then congress's youth leader Maninder Jeet Singh Bitta, who was injured during this blast. 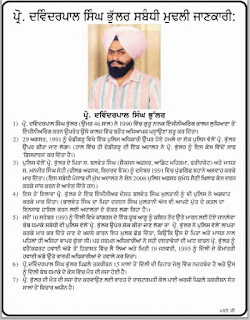 It is important to note that all 133 witnesses called by prosecution failed to support police story and to confirm any involvement of Prof. Devinder Pal Singh Bhullar in 1993 Delhi blast. 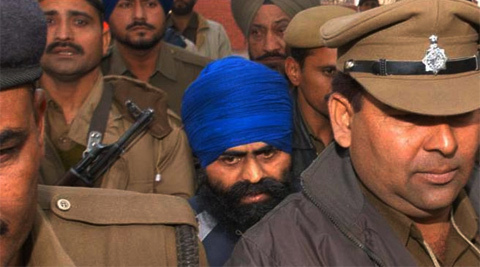 Bhullar is convicted and sentenced to death solely on the bases of extra-judicial confession. This confession was taken while Bhullar was in Police custody. In the court during trial Bhullar accused the police for compelling him to sign blank papers while he was in their custody and denied that he had ever made any such confession. Justice M. B. Shah, who was heading three judges constitutional bench at the SC labeled the confession as "teller made confession" and rejected it. Justice MB Shah acquitted Bhullar while two other judges confirmed the death sentence. 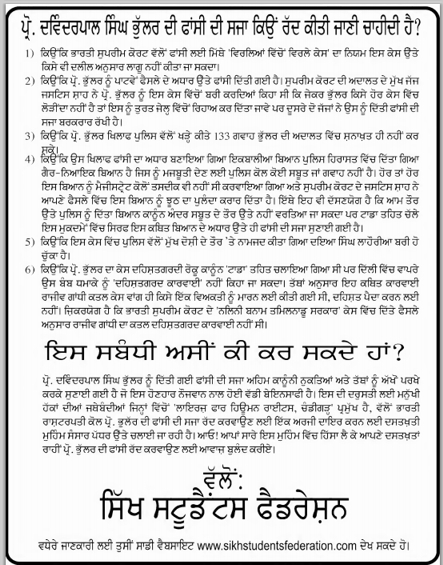 For more details read this document. Bhullar was spared death over mental illness and an inordinate delay by govt in deciding his mercy plea. Bhullar was convicted and awarded death penalty for triggering a bomb blast in New Delhi in September 1993, which killed nine persons and injured 25 others. The Supreme Court on Monday commuted the death penalty of terror convict Devinder Pal Singh Bhullar to life term over mental illness and an inordinate delay by the government in deciding his mercy plea. A bench led by Chief Justice P Sathasivam allowed the curative petition filed by Bhullar’ s wife Navneet Kaur while also taking on record the government’s submission that Bhullar’s was a case that had to be allowed. The Centre had on Thursday told he court that his death sentence should be commuted to life. The Centre had conceded that his wife’s plea for commutation has to be allowed in view of the delay in deciding the mercy petition as well as his mental illness. “This is a case which has to be allowed because the mercy petition… was decided after a delay of eight years,” Attorney General G E Vahanvati had told the Bench. The AG had referred to a January verdict of the SC, ruling that inordinate delay in deciding a mercy petition and mental illness were grounds to commute a death sentence. He also pointed out that this verdict had overruled a previous judgment, which rejected a plea by Bhullar’s wife on commuting his sentence on these grounds. “Besides, our review petition against the court’s January 21 judgment has also been dismissed. So we have to follow the judgment now and we have no problems,” Vahanvati said. The Bench hailed the government’s stand, saying it expected a reasoned decision to help us personalise your reading experience. The court said it will pronounce a formal order next week. Earlier, the proceedings had been adjourned twice to wait for a decision by the President on the mercy petition. However, the AG refrained from informing the court about its fate on Thursday. Significantly, The Indian Express had on March 12 reported that President Pranab Mukherjee and the Ministry of Home Affairs (MHA) were learnt to have differed on commutation of death sentence. While Mukherjee had found favour with the recommendation of Delhi’s Lt-Governor to commute the death penalty, the MHA was against it.